A swimming pool may not have hundreds of parts, but the ones it does have are extremely important. Perhaps number one on the list is a pool pump. It is the heart of any pool’s circulation system so it must be running at peak efficiency at all times. What exactly does the pump do? Why it a pump so important? Read on to find out the answers to these vital questions! What exactly is the pump? The function of a centrifugal pump is to create water movement. It is comprised of several different components, including the strainer basket, motor, housing, and impeller. Once installed on your pool, centrifugal force moves the water around so that it does not become stagnant. 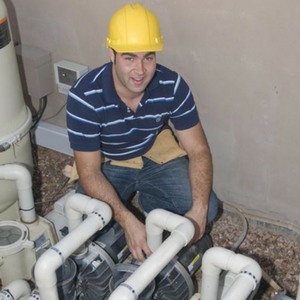 To save time when starting a pump, they are self-priming, removing any air remaining in the system. This creates a vacuum suction effect. When shopping for a pool pump there are several things you need to look for. Noise level – a pool is for relaxing and being bombarded by the incessant drone of a loud pump is anything but. Carefully check reviews to see what others who purchased the same model have to say. Electricity – going green is the “in” thing. Look for models that list significant savings in energy costs. An integrated SVRS (safety vacuum release system) – these smart pumps have an added safety feature. They will automatically shut off if there is a blockage in the drain. The size of the pressure openings, piping, and suction is important. These all influence gallons per minute flow rate. What kind of guarantee comes with the pump and what warranty will you receive? The motor is the most vital component of the pump. There are not interchangeable so you do need to have both. The motor makes it possible for the pump to perform the process of drawing water out of the pool. Once the water is inside the pump, it is then pushed through both the filter and the heater. Check your pump motor frequently for signs of damage, and to make sure it is still primed properly. When the motor loses its prime there is a good chance that the motor will burn out if maintenance is not performed. Motors may be damaged by significant amounts of heavy rain, or when damage occurs to a pipe. A professional best do these types of repairs unless you have lots of experience and feel confident dealing with electricity and water. Why do you need a pump? Having a pump installed on your pool will cut down on plenty of your maintenance time. The heater will work more efficiently, the water does not sit for long periods, and the need for adding additional chemicals is lower than without a pump because they get mixed around with the movement of the water. The pump is also responsible for keeping your pool sanitized. You need to the correct size of pump for your pool, so before you make a purchase speak with an expert to get the right one or check out the pool pump reviews guide we have on our front page. You will notice a huge difference when your pool has a good working pump. There is less labor intensive maintenance for you, and your pool will keep you safely cool all summer long! Next PostWhat should you consider when you’re choosing an above ground pool?